Our Climb for Courage and Climb Higher programs in San Diego (Spring), Boston (Summer) and New York City (Fall) encompass One Summit’s experiential learning approach to building resilience in pediatric cancer patients and their siblings. Please find additional information on both programs below. Due the nature of our work, One Summit does not disclose the date and/or location of any of its experiential learning programs. Interested families and Navy SEALs can apply here. 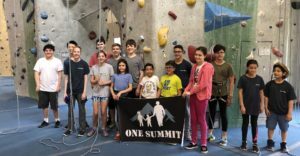 At Climb for Courage, pediatric cancer patients and their siblings are matched 1:1 with a U.S. Navy SEAL and guided through a series of rock-climbing challenges and a learning curriculum based on teamwork, goal setting and overcoming adversity. Their experience coupled with the long-lasting relationship formed with their Navy SEAL mentor provides each child with the additional source of strength and encouragement they need in their battle against cancer. 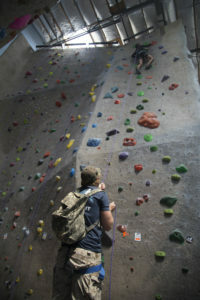 At Climb Higher, past Climb for Courage participants have the opportunity to engage in a “refresher” climb led by a selection of One Summit’s experienced Navy SEAL mentors. The program is designed to reinforce the learnings and skills acquired through Climb for Courage and serve as an opportunity for One Summit’s like-minded warriors to connect and share stories of resilience. I was incredibly inspired by the bonding between the SEALs and children. Watching the determination, exhilaration, and smiles on these kids’ faces spoke volumes to the impact. I haven’t seen my child smile in 4 years until today. My Navy SEAL encouraged me to go higher and work harder. It felt really good because accomplishing your goals makes you happy.